The Rocky Mountaineer experience makes many a bucket list – whether you're retired and looking to splurge, on a honeymoon, celebrating a special occasion or simply planning the trip of a lifetime. But what really goes on behind the scenes of this Canadian icon? What lengths do the staff go to make your experience truly memorable? We caught up with award-winning Executive Chef Jean Pierre Guerin to find out how he runs his kitchen. What is it like to cook on Rocky Mountaineer? Cooking on Rocky Mountaineer is like cooking in a restaurant on wheels! It’s a fantastic experience – when you actually cook on a train you actually cook on a moving platform and you’re also cooking in very close proximity to the guests. Does having guests right next to you make things more stressful? Oh, no! We actually enjoy the interaction with the guests. Because they’re so close, it’s very easy for them to come in and talk to us. Very often the doors are partially open, and we have guests coming in and out and we’ll interface with them. Sometimes the guests will actually come right into the galley and ask for a picture. This is very, very friendly and we actually like the socialisation. 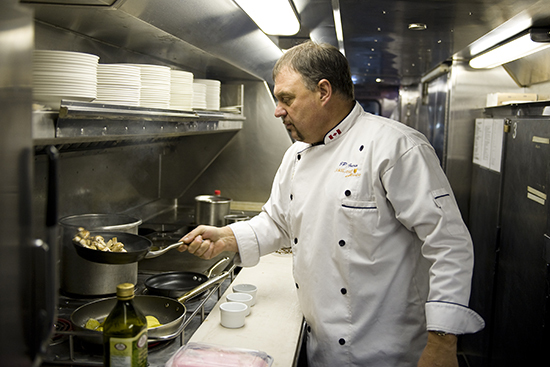 We also make sure that our chef engages and socialises with the guests on board. What other challenges do you face that are different to working in a normal kitchen? Space. Space is limited in the galley, however it is extremely well equipped. Equipment is completely designed for us, it’s designed for cooking on a train, it’s not designed to cook in a restaurant. We have the best equipment you could ask for – perfect for producing the five-star dining that we currently give on the train. How long have you been cooking for Rocky Mountaineer? And what did you do before? I used to work as a corporate chef for an airline. 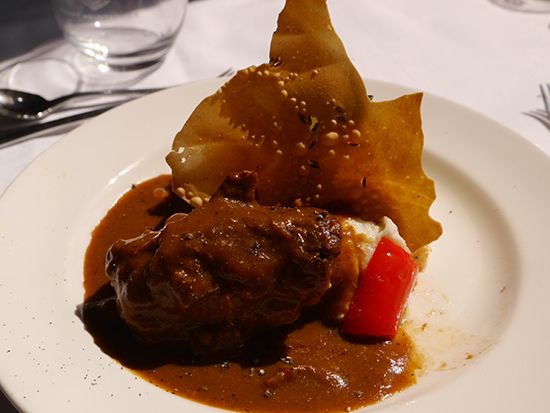 Do you have a favourite dish that you cook onboard? Absolutely. My favourite dish is salmon. I love the salmon! We come from a country where we’re blessed with the produce we have. 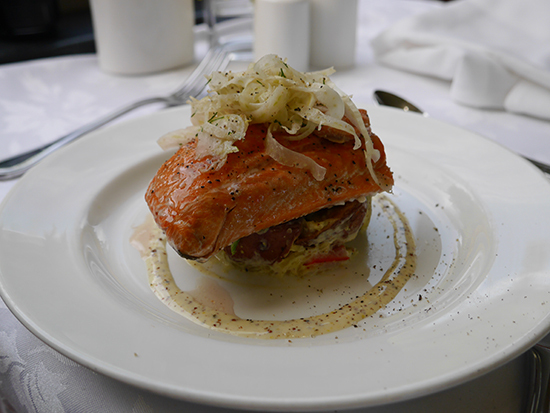 We often serve fresh sockeye – it’s beautiful and the season just started. It’s light, it’s nice, it’s local; beautiful. How many chefs are in the kitchen at any one time? In any kitchen you will have up to three chefs and all three chefs will be responsible for cooking for up to 70 guests. The dining room only has 35 seats and there's 70 people upstairs so we have to do several sittings; we have two sittings for breakfast and two sittings for lunch. It must be quite difficult with three of you in there? That’s why we can only serve 35 guests properly at a time. We have hosts and they will take care of the people upstairs with beverages and services, and the chefs will take care of the people downstairs and make sure that the food is cooked to order. You have full menus and you have your choices – like you’ll have a choice of five breakfasts. What is the most difficult dish you’ve had to cook on the train? Well the most difficult would be when you have to cook to order. Steak for instance. It sounds easy but it’s a little difficult because you have to cook it perfectly and everyone has a different taste when it comes to ‘done’. Anything that requires a long time, like the short ribs that we have, that also can be challenging because it has to stay on the stove for a long time. And remember, we’re still always moving! Do you ever get any big jolts that send you off? We do. And we feel it more in the galley because we’re standing up – when you’re sitting down you don’t feel it as much. We have instances sometimes as we are on a moving platform! But I don’t actually see it happen at all. Sometimes we have a glass that goes over but, apart from that, not really. Tell us something not everyone will know about Rocky Mountaineer, or the Rocky Mountaineer kitchen. Quality, presentation and taste. That is what we do on Rocky Mountaineer, we make sure you have the best quality, the best looking food and the best tasting food all at the same time.